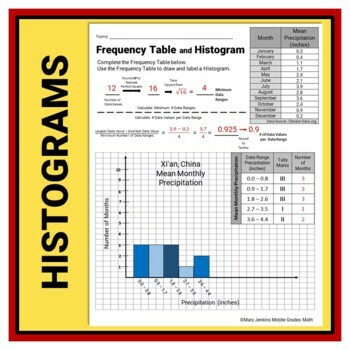 Master ALL 6th Grade Statistics and Probability standards while you enrich your cross-curricular study of Ancient China. Everything is READY–TO-GO with 70+ pages of complete data, calculation, graphing, and analysis templates. Students manipulate and analyze genuine Climate Data (monthly temperature + precipitation) from Xi'an, China and from the Bayan Har Mountains, China (main source of the Yellow River). Students draw Climate Graphs, write Statistical Questions, calculate Measures of Central Tendency (Mean, Median, Mode and Range) and Mean Average Deviation, complete Frequency Tables, draw Histograms, Stem and Leaf, Box and Whisker, and Dot Plots – all the 6th Grade Statistics and Probability Standards!! Students engage in Higher Level Thinking as they analyze calculations and plots to determine and describe Data Distribution and Data Variability. 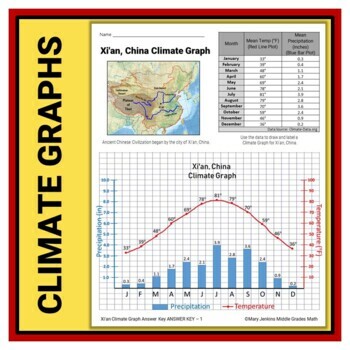 Students compare the temperatures and precipitation of Xi'an and the Bayan Har Mountains and apply this knowledge to the settlement of Xi'an in Ancient China. Full-color Answer Keys are provided for EVERY page. Check out my PREVIEW for a detailed look at included pages. Perfect station activity, substitute assignment, independent work or during testing. Keep skills fresh all year when you add in additional Climate Data Sets from Mesopotamia, Egypt, and India. A text or other source which shows students how to make all calculations, plots and analysis. 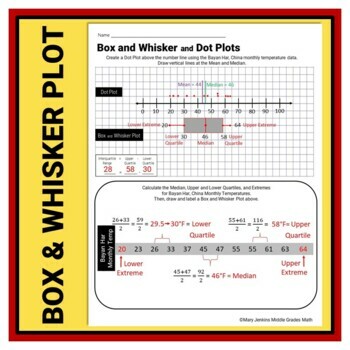 Look at my 6th Grade Statistics and Probability – A Complete Unit for just such instructions! 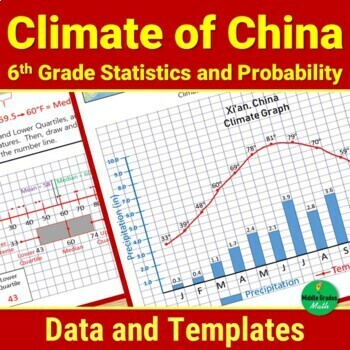 And save $$$ when you Bundle it with this Climate of China Data Set.